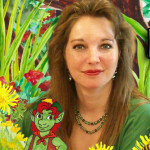 Kathleen J. Shields founded Erin Go Bragh Publishing after deciding that she wanted to self-publish her children’s books so she could retain creative control over the illustrations and designs. That being said, self-publishing has a stigma of “not being good enough” and Shields’ knew that her books were. She learned that many publishing houses were retooling to go all electronic and weren’t considering picture books at the time. She also learned that many of the ‘self-publishing houses only provided paperback book options and Shields’ wanted Hardback. So with a goal in mind, Shields’ researched and learned as much as she could about the publishing industry. While there is still a lot to learn (and always will be) she has successfully accomplished publishing multiple hardback books, more than a dozen paperbacks and a barrel of eBooks. She creates graphics, designs the book covers, and does all of the marketing and promotion herself. While that alone is a lot of work, Shields’ considers this her second job. Her first being website and graphic design, where she has also taught herself video creation and flash animation.